Husky Energy and its partners have achieved a significant milestone in advancing the Madura Strait BD gas-condensate field offshore Indonesia towards production. 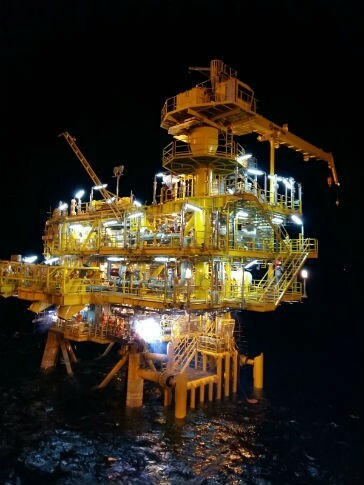 The jacket and wellhead platform for the liquids-rich gas development were sailed out in late October and have been successfully installed in approximately 55 metres of water. Development drilling is now expected to soon commence, and the project remains on target for first production in the 2017 timeframe. The BD field is the first of a series of gas developments the Company is advancing offshore Indonesia. Fixed price, set volume gas sales agreements are in place for the BD field, which is expected to produce net peak production of about 40 million cubic feet per day (mmcf/day) of gas and 2,400 barrels of oil equivalent (boe/day) of liquids. "Our Indonesia gas developments represent some of the strongest growth opportunities in our deep portfolio and are particularly strategic in the current commodity price environment," said CEO Asim Ghosh. Construction of an FPSO (floating production, storage and offloading) vessel to process gas and liquids production from the field is approximately 30 percent complete, and all major long-lead time items have been ordered. The Company continues to progress a series of other gas developments offshore Indonesia that are expected to add production in the 2017-2019 timeframe. A tendering process is underway for a floating production vessel and related engineering, procurement, construction and installation contracts for the combined MDA-MBH fields, also located in the Madura Strait. The MDA-MBH fields are expected to produce about 50 mmcf/day (net) at peak production, and a fixed price, set volume sales gas agreement is in place. A third discovery, the MDK field, is planned to be tied into the MDA-MBH field infrastructure. A plan of development has been approved, and the field is expected to produce approximately 10 mmcf/day (net) at peak. A gas price/volume contract is being negotiated. Longer term, the Company has four other Madura Strait discoveries that are under evaluation for development. The Company holds a 40 percent interest in all of the Indonesia projects, which will be developed in partnership with CNOOC Limited (as the operator) and an affiliate of Samudra Energy Ltd., Indonesia. In addition to the Indonesia offshore developments, the Company has several projects in production and under development offshore China. The Liwan Gas Project in the South China Sea continues to deliver steady production averaging about 295 mmcf/day (gross) and associated liquids of about 14,800 boe/day (153 mmcf/day and 8,300 boe/day net to Husky). Negotiations for the sale of gas and liquids from a third field associated with the development, Liuhua 29-1, continue to be pursued. Husky also holds a 40 percent working interest in the Wenchang oil field, located in the Pearl River Mouth Basin about 400 kilometres southwest of Hong Kong.